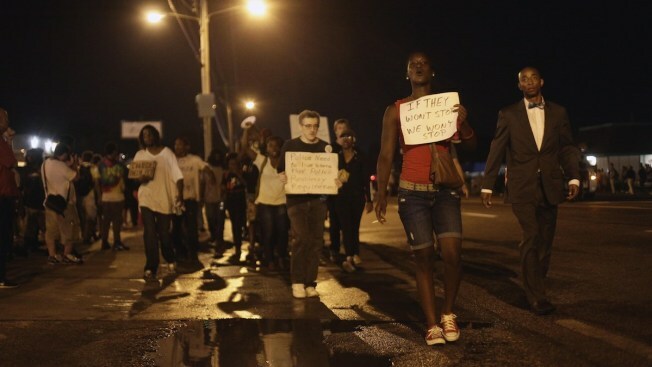 Demonstrators protest the shooting death of Michael Brown August 20, 2014 in Ferguson, Missouri. Four peace workers from Rhode Island are in Ferguson, Missouri, trying to help ease unrest after a white police officer fatally shot an unarmed black teenager. The workers are from the Providence-based Institute for the Study & Practice of Nonviolence. The nonviolence training director at the institute, Salomao "Sal" Monteiro Jr., told The Providence Journal at he and three colleagues arrived in Ferguson on Thursday night. Monteiro says they will be offering support to Ferguson residents and possibly teaching nonviolence training. The institute's mission is to reduce group-related violence. The other three workers are Juan Carter, Ajay Benton and Reuben Tillman. The group plans to be in Ferguson through Saturday evening. Protests and violence erupted in Ferguson after Michael Brown was killed by Officer Darren Wilson on Aug. 9.